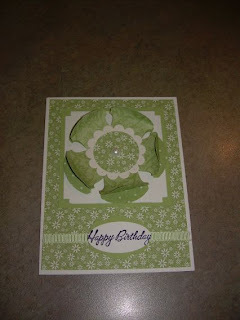 The card above is made with punches and the Stampin'Up Designer Series Paper on page 171 of the catalog. I owe credit to another SU demonstrator, Dawn Griffin who created the card I case'd to make mine. The SU paper is so pretty and comes in many colors. The card pictured is using Certainly Celery. I used shimmery white to make the scallop which gives the flower a glow not seen in the picture. So pull out your punches and have fun. Create a beautiful card in almost no time.